From left: Brittain Ashford and Gelsey Bell. 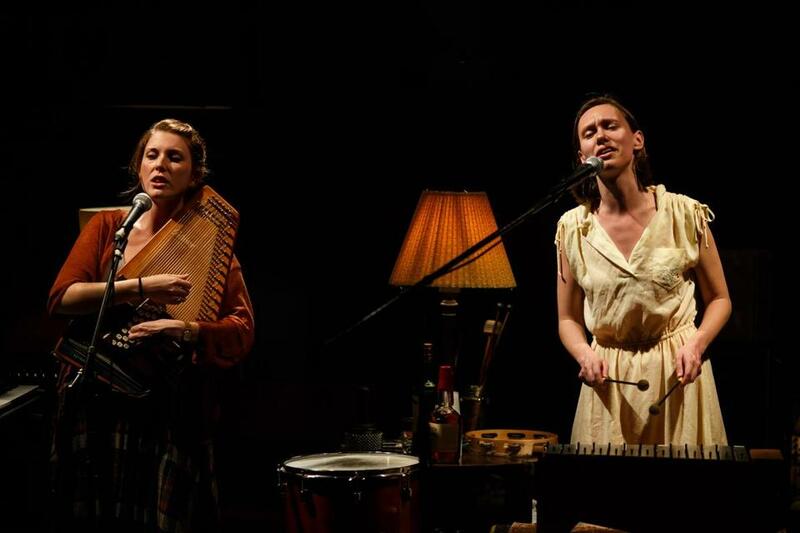 CAMBRIDGE — “Ghost Quartet” unfolds with a subtly seductive allure. A theatricalized performance of the chamber music ensemble’s self-titled release, the show, playing at Oberon through Saturday, is a collection of story-songs full of humor with a dash of horror, told by characters that emerge sharply into focus before fading again into the background. Atmosphere and some stunning vocal and musical talents create an enchanting concert-musical. Members of the Ghost Quartet are positioned in the audience, which sits in a U facing the stage and central playing area. On the stage, Brittain Ashford and Gelsey Bell deliver some breathtaking harmonies as well as spine-tingling interpretations of songs, with Ashford’s lush alto brimming with personality and Bell’s clear soprano ringing out with emotion and power. Composer-lyricist and text writer Dave Malloy plays the piano, keyboard, ukulele, and percussion, while Brent Arnold sits at the opposite corner of the room on the cello, guitar, dulcimer, and the truly haunting two-stringed erhu. Malloy offers up nearly two dozen songs, helpfully introducing the title and the track number for each one, and while references to ghosts, Edgar Allan Poe, Stephen King, “The Twilight Zone,” Neil Gaiman’s “Sandman,” and Grimms’ Fairy Tales all appear, you will also hear riffs from “Frozen” and Stephen Sondheim’s “Into the Woods,” among others. Two of the most evocative moments come with Malloy’s nod to Thelonius Monk’s “Ruby My Dear” and Bell’s a cappella performance of “The Wind & Rain,” described as a 17th-century English murder ballad. stories that set the tone for the music to come, introduce the array of odd characters who populate the story-songs, or invite us into moments between the characters. Always the tone — among the performers and within the music — is one of unaffected sincerity. An awkward pas de deux between Malloy and Ashford is heartbreaking in its simplicity. Director Annie Tippe keeps the stories flowing with a stylish grace and an ease of movement that is so unpretentious you may find yourself eager to take up a percussion instrument if it’s offered, or tilt a glass of whiskey (or cider) poured for everyone as the ensemble sings a tune about four different kinds of the liquor. “Ghost Quartet,” with its tight harmonies, compelling characters, and rich musicianship, draws us into a cozy world to explore our fascination with and connection to otherworldly spirits for a uniquely thrilling evening. Music, lyrics, and text by Dave Malloy. Developed and arranged by Ghost Quartet. At Oberon, Cambridge, through Saturday.